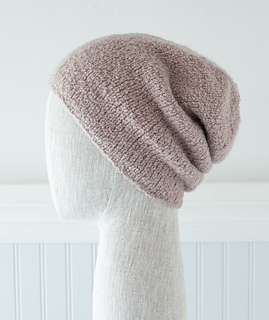 Here’s a simple hat that’s all about the gorgeous yarn. With the subtlest of details and simplest of shapes, the Minimalist Hat is all about the way you feel when you wear it. Its clean lines—no visible edging treatment, no cuff, and nearly no visible shaping—are perfect for sublimely soft, squishy yarns that produce dense, delicious fabric. It just feels good. 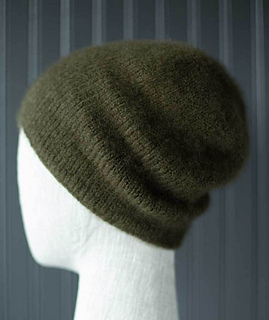 It’s designed in three gauges: worsted, heavy-worsted and chunky weight; and with two lengths for more or less slouch. We have knit seven (yes seven!) 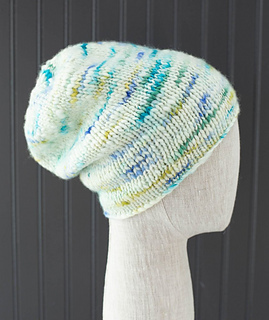 different versions of this wonderfully versatile hat from one single spectacular pattern! Manos Serpentina - Fun and festive in Manos del Uruguay Serpentina. This chunky-weight yarn has a delicate, twisted effect that mimics the paper streamers that fill the air during carnivale. Its charming, hand-dyed, thick-and-thin strand has vibrant colors twirling together throughout! 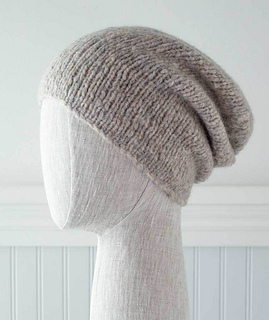 Rowan Cocoon - This version of the Minimalist Hat is knit in Rowan Cocoon, a lofty, soft, chunky-weight fiber. 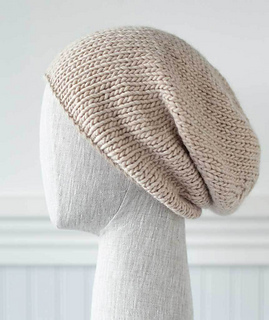 Reminiscent of a roving-style yarn, its blend of merino and mohair gives great stitch definition, a subtle, silky luster, and—in this simple hat—an unbelievable snuggly-ness! Sesia Lola - the Minimalist Hat in Sesia Lola, is a chunky-weight yarn with subtle variegations, a gentle ripple, and a soft sparkle. Lola has a fascinating structure—two larger strands are twisted with two thread-like strands. The difference in tension creates a yarn with a beguiling little wave! Tonal variations and a sequin winking here or there makes for a Minimalist Hat that’s perfect for a night out ice-skating under twinkle lights. Lang Yarns Cashmere Light - In Lang Cashmere Light, the Minimalist Hat is like a small cloud of featherlight fluff. Worsted-weight and oh, so soft, this yarn has a loose, chainette construction. 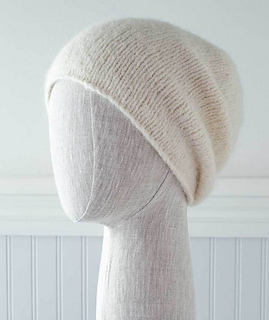 Precious, softly waving fibers from the downy coats of cashmere goats are blown through, giving Cashmere Light (and this simple hat) plenty of puff. Blue Sky Fibers Techno - We knit our Minimalist Hat in the tech-savvy Blue Sky Fibers Techno. This multi-talented, heavy worsted-weight yarn has a core of silken mesh blown through with delicate, baby alpaca fibers. Weightless and lofty, its soft and airy fuzz promises to keep your head nice and warm! Rowan Brushed Fleece - Plush, chunky-weight Rowan Brushed Fleece yields a wonderfully cozy Minimalist Hat. A super-soft blend of extra fine merino and baby alpaca, Brushed Fleece is warm and insulating but remarkably light. And all that plump fluff means you’ll have a snuggly hat in no time! Lang Yarns Luna - The Minimalist Hat is wonderful in Lang Luna. It’s got oodles of texture, loads of softness, and heaps of squish! This worsted-weight yarn has a chainette construction that captures a generous amount of alpaca fiber in a nylon core. 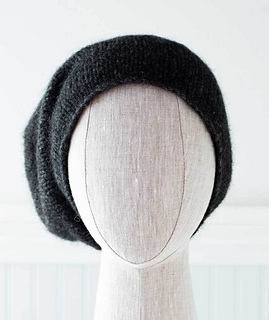 With a strand that’s reminiscent of bouclé, Luna shines in this plush, cuddly hat. 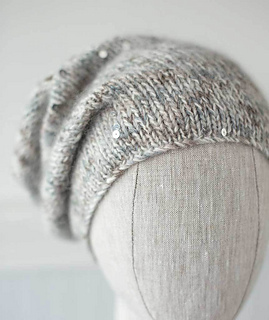 Woolfolk Flette - The Minimalist Hat in Flette, is a dynamic textured yarn. Flette, or ‘braid’ in Danish, is a malleable DK-weight yarn created with 100% Ultimate Merino. One lofty strand is ruched, spiral-like, onto a single fine thread for a puffy, plump bouclé effect. It makes even simple stockinette have the texture and squish of a cloud! For our Blue Sky Techno version, click here. For Lang Light version, click here. For Lang Luna verision, click here. For Manos Serpentina version, click here. For Plucky Knitter Snug, version click here. For Rowan Brushed Fleece version, click here. For Rowan Cocoon version, click here. For Sesia Lola version, click here. For Woolfolk Flette version, click here.